The Jeep Cherokee is a great new update to the beloved model of Jeep’s line. The Jeep Cherokee is equipped with modern designs and bold lines and accents. Inside, there is more technology than ever, including Apple CarPlay and Android Auto support, keeping you connected to the friends and family that you need. The Cherokee comes with a 2.0 L Turbo Engine, which gets you awesome gas mileage. The Cherokee’s safety standards and security gives you piece of mind when you need it the most. There are Jeep Dealerships serving Thornton Colorado that would love to show you just what the Cherokee can do! 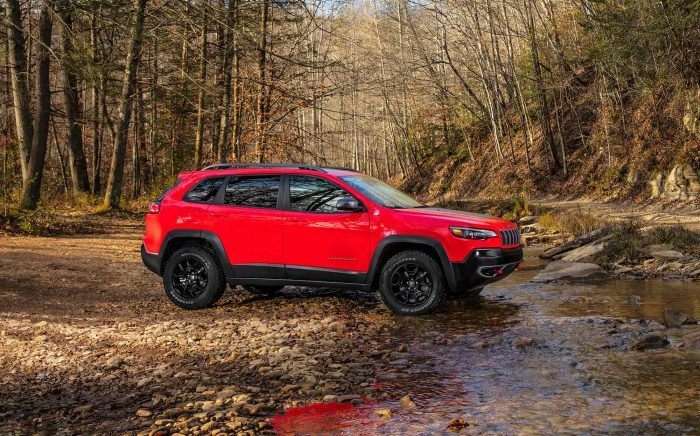 The exterior of the Cherokee is dynamic. The bold front end and tailgates have been remodeled, giving off an intense look. The LED headlamps and fog lamps have been improved as well to give a more refreshed style to the front end. The daytime running lamps have been improved with better lighting and performance for added safety and security. The rear of the Cherokee has been completely remodeled with better taillights and moving the license plate to the center of the tailgate instead of the bottom. This gives that whole area a more streamline look and feel. The lift gate has been updated as well, now being hands-free, the lift gate is foot activated, which makes it easier getting things in and out of the tailgate. The Cherokee still features signature looks with trapezoidal wheel arches and the seven-slot grille. The Cherokee is also equipped with larger window openings to give the driver better visibility. The exterior also features other amenities like heated exterior mirrors to keep ice and fog from building up and hindering your visibility. There are also available rain sensing windshield wipers that are able to detect rain on the windshield and begin wiping the droplets away to give you better visibility. 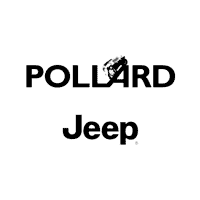 Contact Boulder Jeep for more information or any of your Thornton Area Jeep dealerships serving Thornton Colorado. The interior of the Jeep Cherokee is sleek and well crafted. The comfort and style that the Cherokee has to offer is sure to be amazing. The interior is designed with soft Nappa leather-trimmed seating. There are several improved storage options for a great cabin experience. The interior offers refinement right down to the bare details. There is an available heated leather-wrapped steering wheel is a really great for those who live where freezing temperatures are possible. There are chrome accents all over the interior. They give the interior more style by bringing attention to all the best parts of the vehicle like the steering wheel, center console, shift knob and door handles. The seats are leather trim and cloth and they are available with black stitching. The interior is also equipped with UConnect, which is the Cherokee’s connectivity technology. This is a user-friendly, driver-safe technology and you can stay connected to what you need to know first. It even comes with a subscription to SiriusXM Guardian, which helps you keep an eye on your vehicle. You can lock your doors from your phone with the UConnect App and call for help if you need to with the SOS Call and Roadside Assistance Call and help yourself find your car in a crowded area with the Vehicle Finder option. Your also have the option of a seven inch touchscreen or 8.4 inch touchscreen. 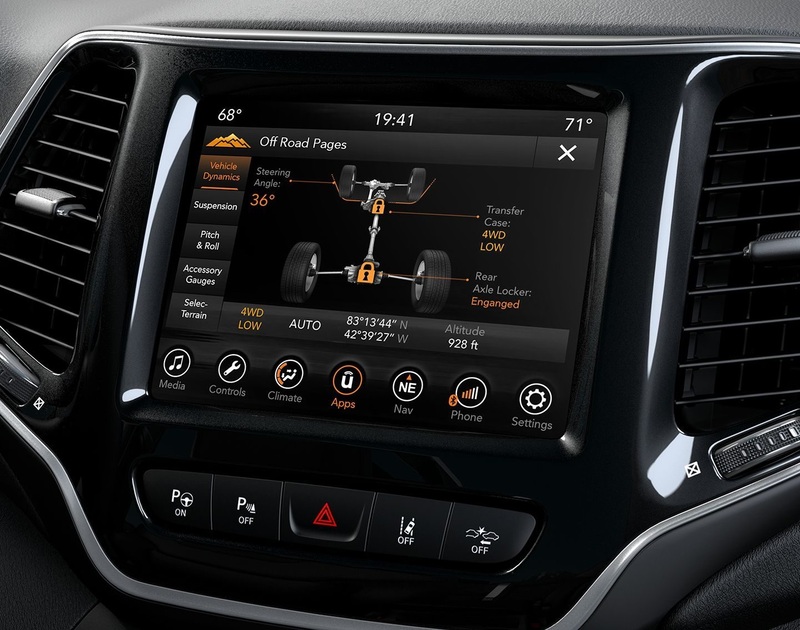 This display screen can support all of the different technologies that are listed on the 2019 Jeep Cherokee. Visit your local Thornton Area dealership to see what specials to Thorton are available. The Cherokee is equipped with the trail rated badge, meaning that it has the ability to perform well even in the harshest weather conditions. It has traction, clearance from the ground, and maneuverability. 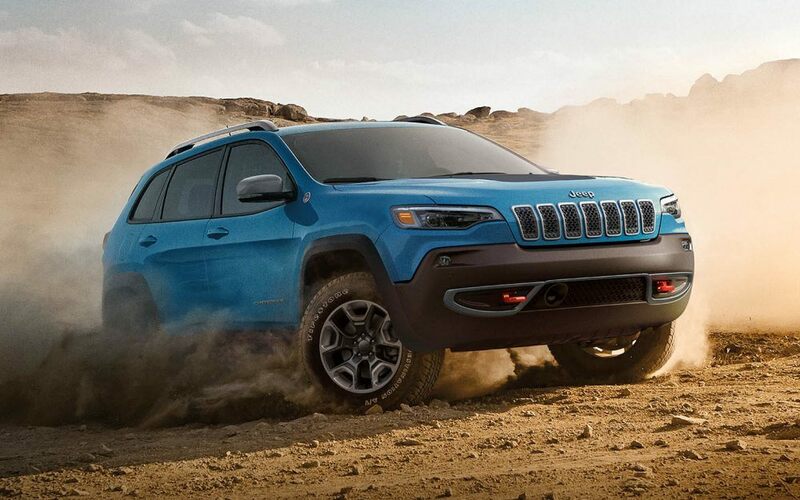 If you plan on taking the Cherokee off-roading, have traction is important. The Cherokee has all of these qualities offered on the 2019 model. To check out these specs for yourself, contact Boulder Jeep for a test drive. The 2.4L Tigershark Multiair 2 engine of the Cherokee is complete with 180 horsepower and 170 pounds of torque, which helps you get to where you need to go quickly. There are other engines offered – the Pentastar V6 with 271 torque, and the 2.0L Turbo Engine with 270 pounds of torque. These engine will provide you with the horsepower that you need in order to tow whatever it is that you need to tow at that moment. All of the engines have a nine-speed transmission and are capable of going fast and towing things with the optional tow hooks. Come in and see what specials to Thorton that Cherokee has to offer. The Cherokee is made of strong steel that maximizes crash protection and has vehicle dynamics and weight. There are eight standard airbags with full-length side-curtain, driver, and front passenger provide lots of protection for your passengers. The Cherokee has blind spot monitoring, which helps monitor the space between you and other vehicles on the road. Dual radar sensors will detect when there are others are entering one of your blind spot zones. You will receive an audible chime and warnings on the dash, as well as on the mirror that the car is coming in the blind spot of. The Cherokee comes with a Parkview rear back up camera which is a great for seeing what is behind you and avoids accidents with other cars or pedestrians. The Cherokee has Keyless Enter ‘n Go, which is a key fob that you will be able to place in your bag and you will be able to use the push to start feature without fumbling for your keys. Another alert will go off when you lock and unlock the vehicle because of the security system on the Cherokee. SiriusXM Guardian allows you to be able to lock and unlock your car’s doors and call for 911 if you ever need them, all from the comfort of your phone! The 2019 Jeep Cherokee is still the same vehicle we all know and love, but with a few newer upgrades. 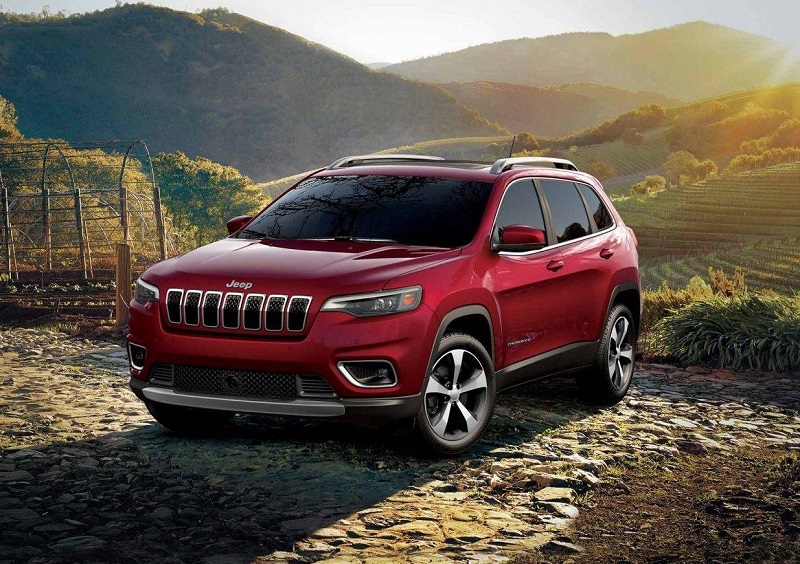 Contact Boulder Jeep Dealership for more information about the Cherokee and take it out for a test drive while you’re there! You are sure to love this awesome SUV. Serving Thornton Colorado for many years, the dealerships are sure to give you the best offer that they can, with certain specials to Thorton not offered anywhere else.